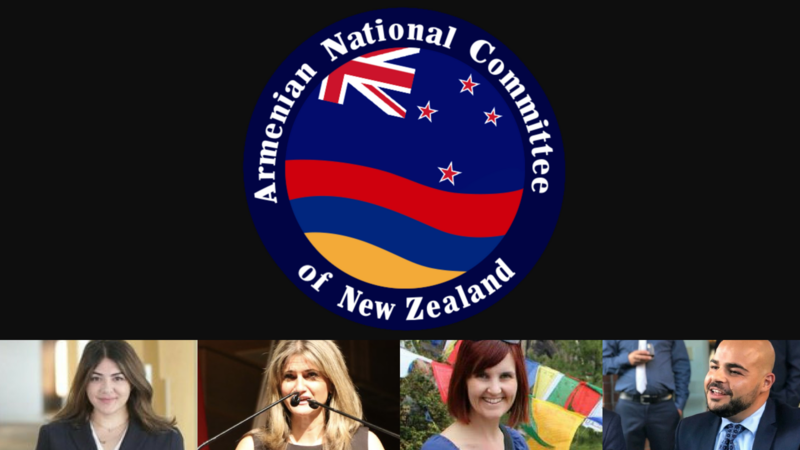 AUCKLAND / WELLINGTON: The Armenian National Committee of New Zealand (ANC-NZ) has formally launched to coincide with events in capital Wellington and Auckland, which will raise awareness of the Armenian Genocide and the century-long battle for justice. ANC-NZ’s inaugural Chairperson will be Ms Hoory Yeldizian, who announced her newly-formed organisation’s goals at the New Zealand Parliament, where an international delegation is visiting, which includes Boston-based Professor Taner Akcam and her colleagues from the Armenian National Committee of Australia (ANC-AU), including Executive Director Haig Kayserian. "Our primary objectives are to advocate for the interests and concerns of the Armenian-New Zealander community to the New Zealand Government and its agencies, including in relation to local community issues, fostering closer cultural and trade relations between New Zealand and the Republic of Armenia, as well as public awareness in support of a independent Armenia and its security, to advance the recognition of the Armenian Genocide by the New Zealand Government, for the recognition of the Republic of Artsakh, and to represent the collective Armenian-New Zealander viewpoint on matters of public policy," Yeldizian said. She added: "We are very grateful to our colleagues across the ditch at the Armenian National Committee of Australia for helping us join the international family of ANCs, and we look forward to working closely with them. And this couldn’t have been achieved without the support of the Armenian Society of New Zealand and the Armenian Society of Wellington, who we look forward to working alongside to achieve tangible outcomes for the greater Armenian good." Kayserian, who was present at the inaugural events on behalf of ANC-AU along with Administrator Olivia Dilanchian, congratulated the new ANC-NZ team. “We very much welcome and are beyond delighted at the formation of ANC in New Zealand, which is made up passionate Armenian-New Zealanders with outstanding resumes, ready to do their community proud,” Kayserian said. An ANC-ANZ Council is also being established to help coordinate closer cooperation and resources between ANC-AU and ANC-NZ, and for their Trans-Tasman activities. Joining Yeldizian, who is a solicitor, on the inaugural Committee is Politics lecturer, Dr. Maria Armoudian, forensic psychiatrist, Dr. Yvette Kelly and digital marketing consultant, Alex Yeldizian. Further additions are expected to be announced in coming months. Hoory Yeldizian (Chairperson) is an experienced civil litigation solicitor and barrister, currently working in Auckland. She specialises contractual disputes, insolvency and fraud. Raised for a short time in Baghdad, Iraq, Hoory and her family moved to New Zealand when she was age 6, where her parents co-founded the Armenian Society of New Zealand. Shortly after receiving her Bachelors in Law, Hoory was selected to work in human rights in the United Nations, Geneva. She is a long-time volunteer in Armenian interest groups and spent 6 months volunteering across Armenia with Birthright Armenia. During this time in Armenia, Hoory set up a grassroots charity with other volunteers called The Nver Project resulting in the outreach of aid to 1000+ Armenian children across Armenia and Artsakh. Dr. Maria Armoudian is a Senior Lecturer in Politics at the University of Auckland. She is also a published author, radio broadcaster and journalist. Her two books are Reporting from the Danger Zone: Frontline Journalists, Their Jobs and an Increasingly Perilous Future and Kill the Messenger: The Media's Role in the Fate of the World. Prior to moving to New Zealand, Maria worked as both a city commissioner in Los Angeles for six years and the California State Legislature for eight years. Dr. Yvette Kelly was born in Wellington to an Iranian-Armenian mother and New Zealand-European father. A forensic psychiatrist, Yvette's Armenian roots led her to spend two months living in Armenia in 2008 working at the Arabkir hospital in Yerevan. She is passionate about New Zealand officially recognising the Armenian Genocide, both because of her origins but also because of her long standing interest in human rights. Yvette also was the co-founder of NZRecognise, an organisation made for the promotion, recognition and education of the Armenian Genocide. She has visited genocide memorials in Cambodia and Rwanda, and has been a member of Amnesty International since college. Alex Yeldizian is a digital marketing consultant by trade, bringing across his extensive experience in digital marketing with a background in marketing, communications and finance. His broad-based experience encompasses exceptional work ethic and commitment to organisational objectives. Alex has strong ties to Armenian affairs with his experience as marketing consultant to Armenian Society of New Zealand, advising on cultural marketing for maximum outreach.